Jones may not have any sense of heroics, but he is a hero. Heroes achieve feats that we mere mortals can only dream of realising. Heroes are modest. Heroes are fearless. Heroes respect the challenges that lie before them. Eric Jones is a hero. Summing up Jones’s achievements could, on its own, fill this chunky, liberally illustrated volume. 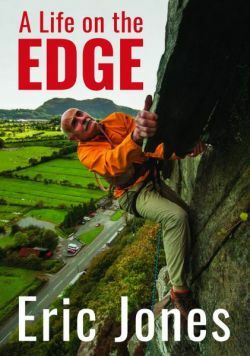 Greg Lewis manages to compress them into his opening blurb: Jones was the first British man to climb the Eiger’s north face, he has soared over Everest in a hot air balloon, he has parachuted onto the North Pole, he has skydived into the Cave of Swallows in Mexico, and now he has written, with Lewis, a cracker of a story. To someone like me who is terrified of heights (I live in a bungalow), Jones is a superhuman. Leo Dickenson, cameraman-climber extraordinary, reveals in his foreword that in fifty years of knowing him, he can never remember Jones refusing an adventure. Yet Jones has known fear – his greatest being chased by a cockerel. His fascinating tale leads us from humble beginnings at Brynsaithmarchog around and above – and in some cases below – the earth. Heroes, of course, can be boring. Like cockerels, some tend to crow. Jones, however, understates his feats. Imagine him hurtling towards seemingly certain death on the North Face of the Matterhorn. Rather than panic, he merely hoped it wouldn’t hurt. Incredibly, despite such dangers, he manages to posses an inner peace. Jones is the kind of man whose hand I would dearly wish to shake. But please let it happen on level ground! See the original review on the website of the Welsh Books Council. But perhaps he truly has nine lives. He was the first British man to solo the Eiger North Face – one of the greatest challenges in the climbing world. On the Matterhorn, he was swept within 10 feet of a sheer precipice. As he soared over Mount Everest in a hot air balloon, he had to climb outside the basket to relight the burners. He has climbed dangerous mountains on five continents, parachuted onto the North Pole and BASE jumped from skyscrapers, bridges, masts and mountains. He skydived into the Cave of the Swallows in Mexico, dropping into the 1,400-foot hole in the earth. Astounded people often ask Eric a question: Why do you do it? It is something that cannot be answered simply. For Eric’s life on the edge is quite a story. Want to know a little more about Eric? Check out this five minute film.